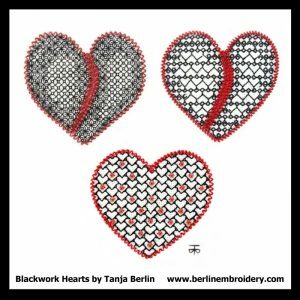 Free instructions for the Blackwork Hearts. It is hard sometimes to put into words how you feel for a loved one and a piece of stitching can speak for you. I have charted the broken hearts for loss of a loved one through death or romance and a valentine heart embroideries for you to make for your loved one. No part of the instructions can be used for commercial purposes, profited from, published in print or on the internet without permission from Tanja Berlin. 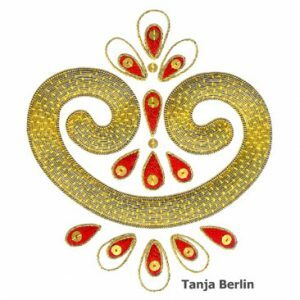 Free instructions for the Goldwork Sampler embroidery and optional kits. 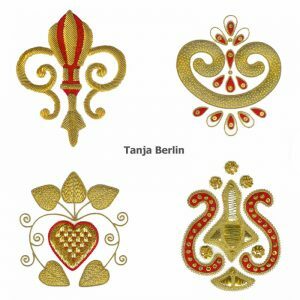 The Goldwork Sampler is a great design for learning how to use different metal threads. I provide the instructions for free in the form of a PDF file with 45 pages of diagrams, colour pictures and instructions for working the sampler. You can use the sampler instructions to work the sampler or as a reference manual for sewing down metal threads. No part of the instructions can be used for commercial purposes, profited from, published in print or on the internet without permission from Tanja Berlin. 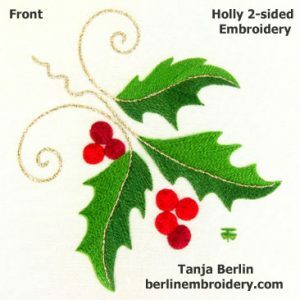 Free instructions for the Holly 2-Sided Embroidery. 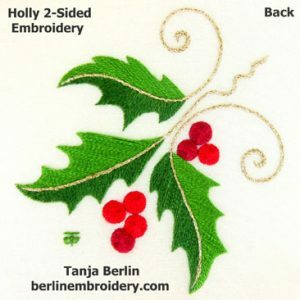 The holly is a great design for learning how to do 2-sided (reversible) embroidery, in which the back looks like the front. I provide the instructions for free in the form of a PDF file with 13 pages of diagrams and instructions for working the holly.